When I first used Android smartphone during 2010, one app gave me a big impression, that was Shazam, a music identifier app. Soon I found that SoundHound is a better app that it. However Shazam is looking for huge market in India, for that they needed the Indian music database. In January this year Shazam has some trial run with country’s largest cellular operator Airtel. But Shazam has probably unlocked the Indian market after it partnered with online music streaming service Saavn to get access to Saavn’s huge regional music database which includes music from different languages like Hindi, Punjabi, Tamil, Telugu, Gujarati, Marathi, Bengali, Kannada, and Bhojpuri, as well as genres like Bhangra, Devotional, Ghazals, Carnatic, Indipop and others. 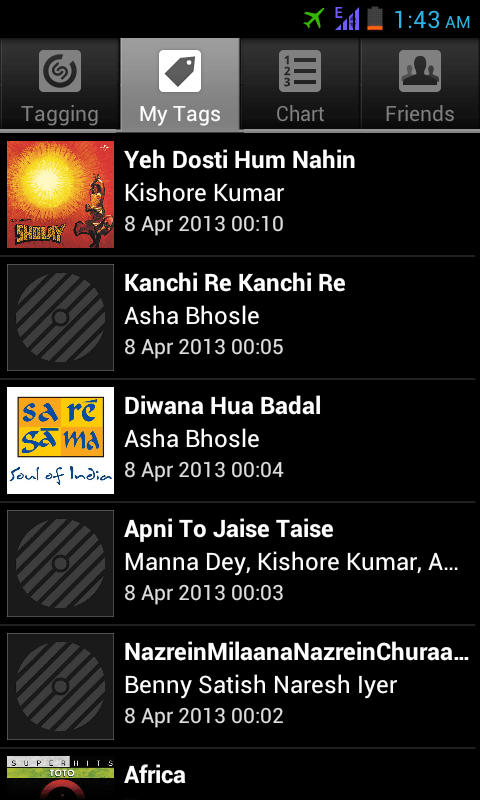 So when I heard this update of Saavn and Shazam, I tried it once again. To my surprise Shazam worked too good. I turned on the FM Radio and run Shazam to identify the music. Shazam did not fail in a single chance. And yes, it worked fast even on a 2G network. Advantages of Shazam are many: It is free (monetizes from advertisements and media companies), no advertisement from Saavn, easy to use UI, fast to identify, you can integrate it with your facebook account. Currently there are lots of similar apps for Android and iOS – Sony’s TrackID, SoundHound (Free & ? paid version), Hound, VerizonID, Mobion Music Global, musiXmatch, SpotSearch. But with huge Indian content database Shazam will tap the market faster. I recommend all readers to try it. The Notification in the given picture, shows both Airplane mode and Edge network (with Internet ON)…. How is it possible??? it was a dual SIM smartphone. I kept one SIM in airplane mode, another other one’s data active.